Muvo would like to keep your clothes looking and feeling as new for as long as possible. We have put together a couple of useful hints and tips to help you achieve this. To keep your clothes looking newer for longer please remember that liquid detergents perform better with colour protection on clothes compared to the majority of laundry powdered products. They also are less likely to cause bobbling with your garments. 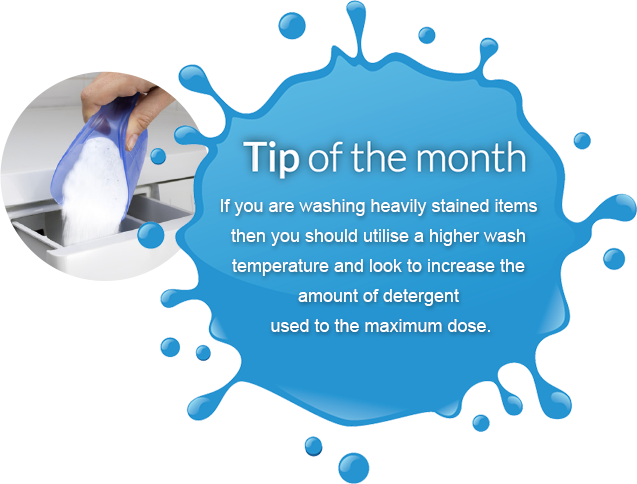 If you are washing heavily stained items then you should utilise a higher wash temperature and look to increase the amount of detergent used to the maximum dose. Powdered detergents typically perform stronger on whites and allow for stronger stain removal due to the oxygenated bleaching agents within the product, this means that to achieve maximum whites a powder can produce a stronger result. Please remember that for optimum results you should use your Muvo product in conjunction with a Fabric Softener where clothing labels permit. Please remember that some items of clothing are not recommended for use with a fabric softener such as jeans as they can weaken the material. Muvo if used on lightly soiled items will perform well at 30⁰c and provide a more cost effective cycle and reduce energy consumption. If washing at low temperatures it is recommended that you use an increased amount of detergent to allow for better stain removal. Cleaning the seal around the inside of the door on your washing machine is recommended as often as is required to remove the potential for odours and also the risk of dirt or debris marking your washed items. When dealing with tough stains you can use Muvo to pre-treat a stain by pouring a small amount of neat liquid on to the stain and gently working the liquid in to the stained area before placing the item in to the machine. It is recommended that customers should always run their machine on a high temperature (90⁰c) wash at least once a month with either a recommended cleaning product or alternatively a good quality powder detergent. This should be performed when the machine is empty to allow for cleaning of the washing machine and the removal of germs and bacteria that are not always removed when washing at low temperatures as is typical today in many modern households. This will also help to reduce the build-up of odours in the machine. SNG. Company No 7462063. VAT No 103055862.